Home of the Eternal Beginner & Splitters Swamp Creek, my first Show Layout. 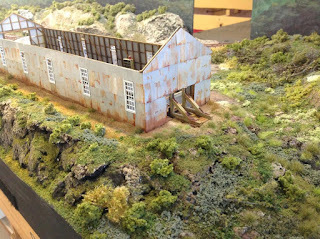 NSW HO modelling Steam Era pre 1960. I've been working on a few projects of late. The first has been the addition of a white board to the workbench to write a few ideas down on. The intention being to keep me focussed on what is my current job to complete, and what comes next. Yes I know I used the dirty word, job, but it does serve it's purpose, that being to keep me on the right track, no pun intended! There are a few jobs listed, many involve updating the layout as my modelling skills?/focus changes or improves. The signal for instance has been half built for so long now relegated to the bottom of the half built projects box. So it's been a little bit cleansing to add some real plans to my modelling moving forward. 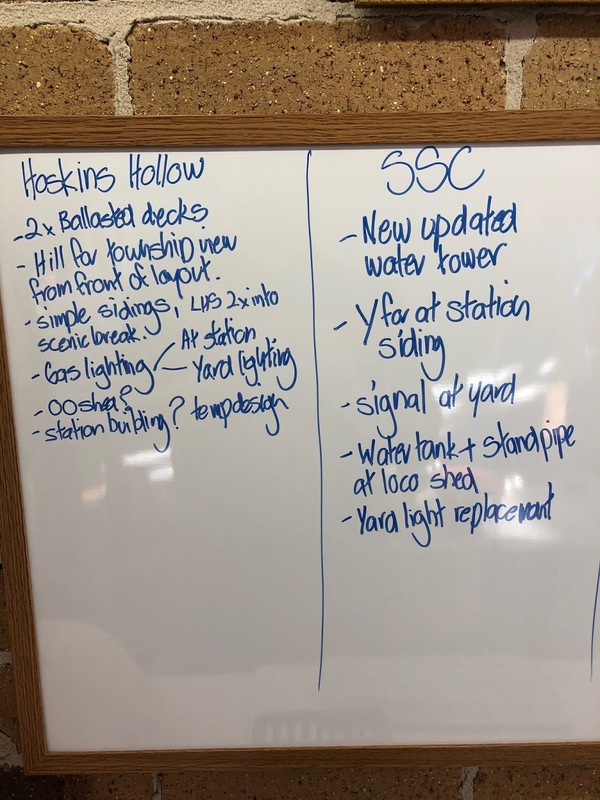 Then there's the plan for the next layout, Hoskins Hollow, and indeed, my home layout Eugowra. There's so much ahead I really need to keep moving things along. 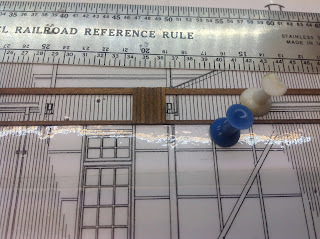 Over time the layout has had a few issues with the track geometry, whether being poor design, or poor soldering skills. I'm ok with either, as I've said for ages, this is my first effort and it has had it's issues along the way. 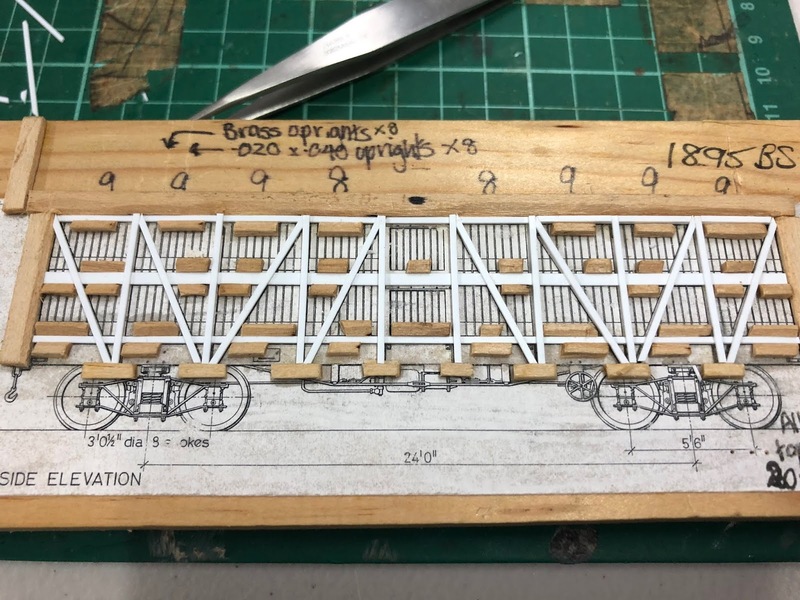 The first issue was the track gauge in some areas, being a little wide, or that the PC sleepers were a little wide apart to hold the track in gauge if a heavier locomotive was being run. 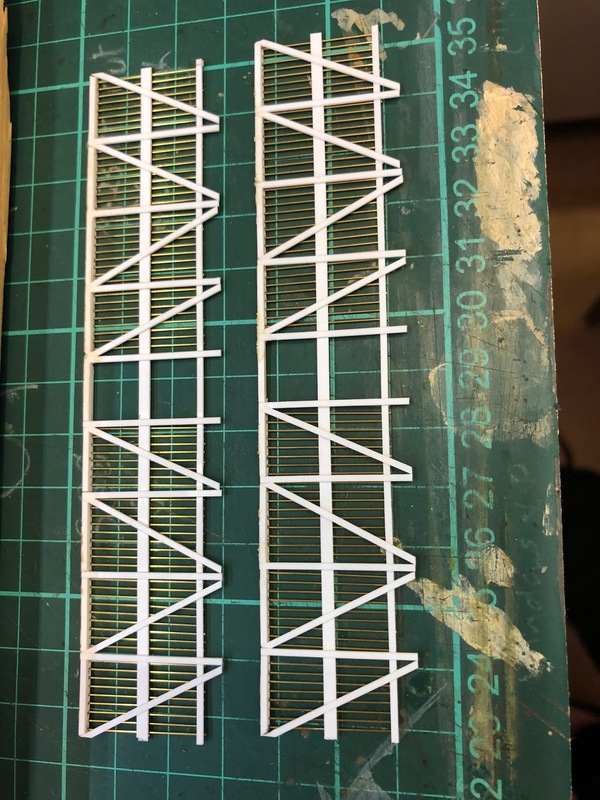 There have been many extra PC sleepers added to the layout, and it has meant that next time I would lay a PC board sleeper at least every four, so that the track gauge is held in check. The second obvious issue has as been a tight S curve of track on the siding leading into the Station. It has caused random derailments every now and then, often enough for me to consider other track options to fix the issue. All the points on the layout are number 6 LH or RH turnouts, and in this location a Y would remove the S curve and allow smoother running. This then is the current track project on the workbench, so I'll keep you posted on progress. Now to the rollingstock project. This one has been on again and off again for many years. Well after a few false starts I've managed to complete a few parts so that I'm encouraged to do some more. The BSV has been time consuming but worth it I think. It is an early days project that I hope to have completed by this years Early Days convention down in Sydney in July. 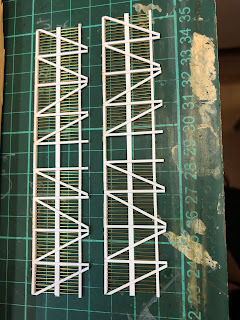 The job of installing 80 pieces of wire into each side along with 160 pieces of square styrene to hold them in place, has had me a little, well nuts I think. This is the first two sides of a total of six I need to construct for my use. The chassis of all are fairly straight forward and do need some detail added to complete. 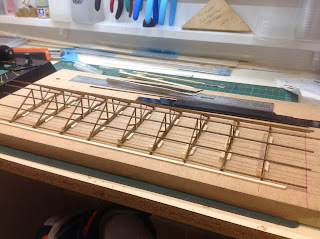 The middle deck is supported underneath, which is a bonus as it will add to the stiffness of what is a fairly flimsy construction. The order of construction will dictate when parts need to be painted as well, more to to in this space! 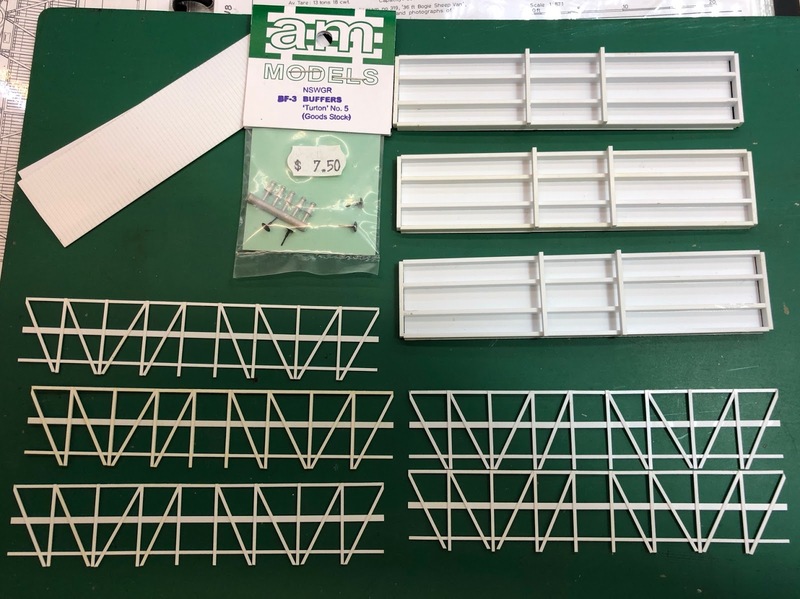 I look forward to a new addition to the Mechanical Branch models range, that being a smaller water tank and stand kit for at my Station building, more in keeping with the size of my layout. Then there is the completion of the signal in the yard, and some additional lighting for the layout, both inside the loco shed and on the station platform, gas lighting I'm hoping, more in keeping with the 'age' that I seem to be drifting back to. Then theres the LHS of the white board, and that's a whole other story! Enjoy your modelling, have a great week! 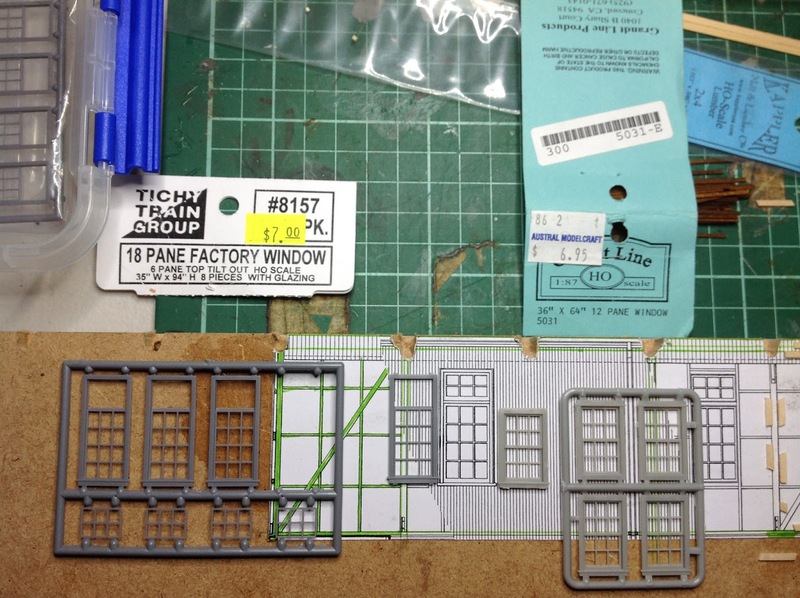 I've been beavering away on a few smaller parts for the loco shed. The smoke hood and associated smoke stacks have been on the workbench for a while now. Then there's the shed doors to be constructed. The last part of the building has been the extension of the roof. Yep, measure twice cut once, doesn't always get followed to the letter. Consequently the roof has been set aside for a while as I thought on the best way to move forward. There are moments in this hobby, for me, where the fine art of procrastination seeps into the conscious mind, and makes the idea of moving forward simply impossible. That's the way it's been regarding this roof issue, for what seems like months. Well not seems like, it has been months. In the end the job ended up being easier than I thought. I had to remove all the iron and then cut it into two pieces. Then I extended the roof by the few millimetres it needed, then a reroof. 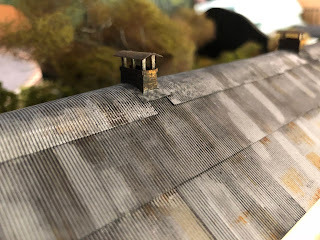 The smoke stacks are made up of basswood with the top being made from cardstock that has had various paints put on to have it look like metal, somewhat weathered. 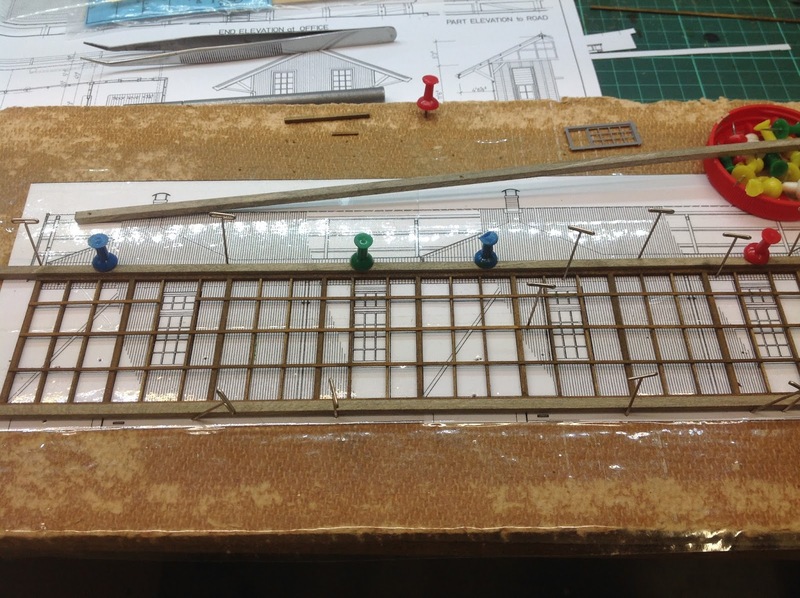 Then it was simply a case of adding the curved iron for the top of the roof, and yep, there she was. I've gotta say I really like the mass of this building and what it adds to that end of the layout. So there she is weathered up a little bit, and set into the scene. I've enjoyed the construction of this building, even though it's taken way too long. The finished product is something I'm happy with, can't wait to have built some steam to be in there! The 'to do' list doen't seem to be any shorter these days. Enjoy your week, model a bit, laugh alot! I thought it worth showing you all what I've been up to. 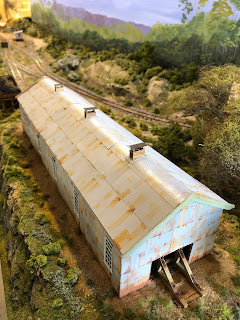 The next step in the completion of the loco shed was to weather the building then continue the scenery or greenery around it. I enjoy weathering, however it seems that each time I have a crack at it, my technique changes. 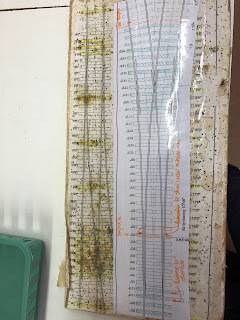 This is a good thing if you are after variation. This time though I made a few notes in my trusty notebook for future reference. 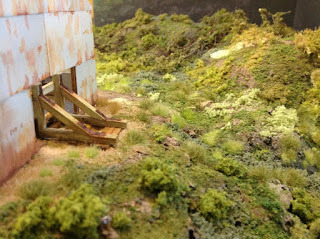 I used three products for the rusting of the corrugated iron, two rust coloured washes and isocol. I began by putting on the lighter wash first, even dry brushing of this seems to work, as it doesn't take too much to be a little heavy handed. A second coat of the same wash I applied to give the rust some depth in a few areas. Next was the dark rust wash, not a lot of this was applied, but it is worth it. After all this I had a break from it, did a few other things, then came back to it. It is surprising how your perspective changes after a break. The weathering was 'calmed down' with an earbud dipped in isocol. The high points of the corrugations are less likely to rust, so removing the rust from some of the high points really does make a difference. The greenery is fairly run of the mill stuff, although I think that I need to reduce the colours that I've been using. A few extras have made there way into the mix. I need to reduce the number of colours, otherwise in my opinion, it looks too busy, and a little overdone. I'll have another look at it in a few days, and may need a touch up, as in I'll take some off or overlay with another colour. On the workbench there are assorted spindly tree thingies that will soon find there way into the undergrowth, along with some sturdier ones as well. More on that next week. Yep! Next week, it has been ages since some modelling time presented itself, and I really haven't had much modelling mojo to get me back into it this new year. So yessiree weekly updates are the go! Here's hoping! There has been some changes to how I've constructed the loco shed. 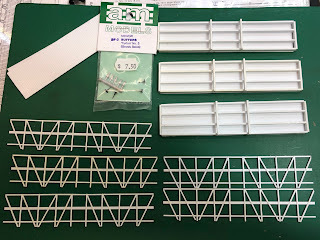 Previously I had been constructing the shed bay by bay, unfortunately this meant the structure was not strong enough along its length to be self supporting. If I'd built it from the base up it may have worked, but this would have slowed up construction much more and brought with it other issues. A rethink, and a restart of the project was required. So the new version has a top and bottom rail that runs the length of the building, thus meaning each of the four sides can be constructed on the plan separately then joined together. The resulting sides are much stronger and we're faster to build. 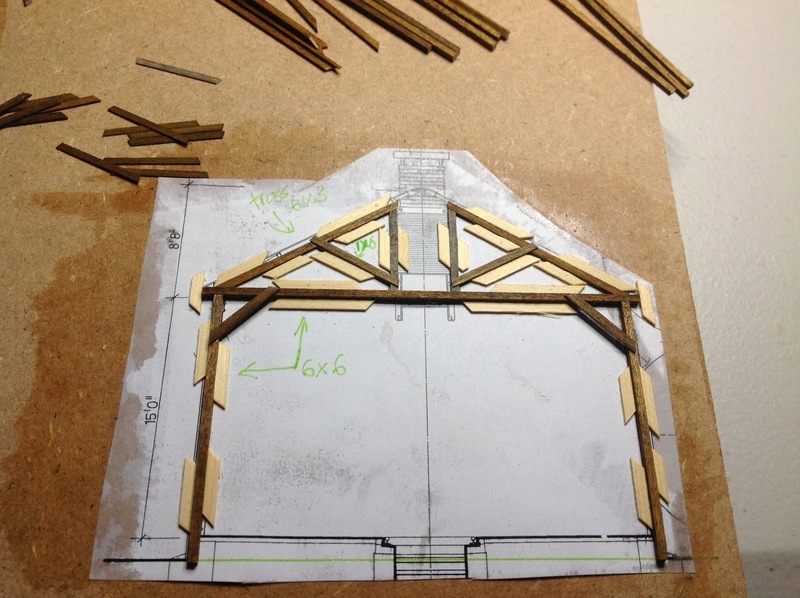 I moved on to the roof trusses and made up a simple jig to hold them all in the correct alignment. The four sides have been glued together, and can be seen here set on the baseboard, but not fixed down yet. I still need to build up the ground to sleeper height, and add the inspection pit. I tried using a new product from Riot Craft stores for the floor of the shed. It is an acrylic paste with a fine texture in it. My thought was to then add some paint on this surface as the floor of the shed. You can see in these few photos how I've put down the floor of the shed. 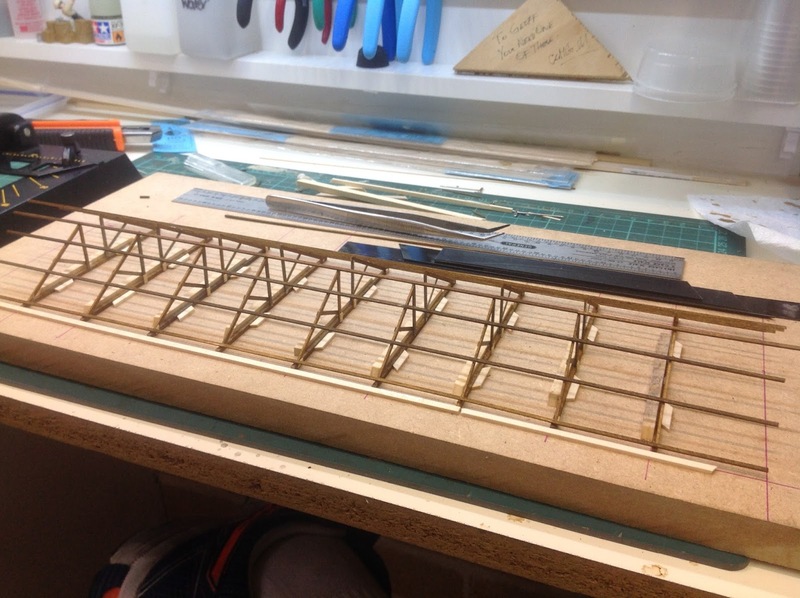 I've left the edges free of the flooring so that the base of the walls sit on the balsa base. 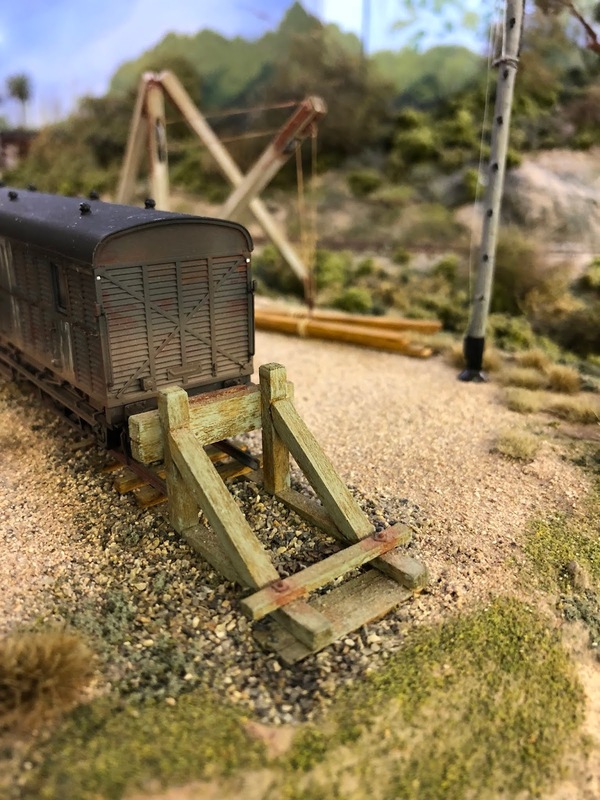 The rails are contained within the flooring and the surface slopes down away from the rails so that locos can run into the shed without the risk of not running back out. The paint of the floor is called blue bitumen from Modellers Warehouse. This paint really goes along way with plenty of coverage from a small amount, well done Dave! plan it's half in/out of the shed. You can see here the main structure mounted on the base. From here it was onto glueing on the corrugated iron. 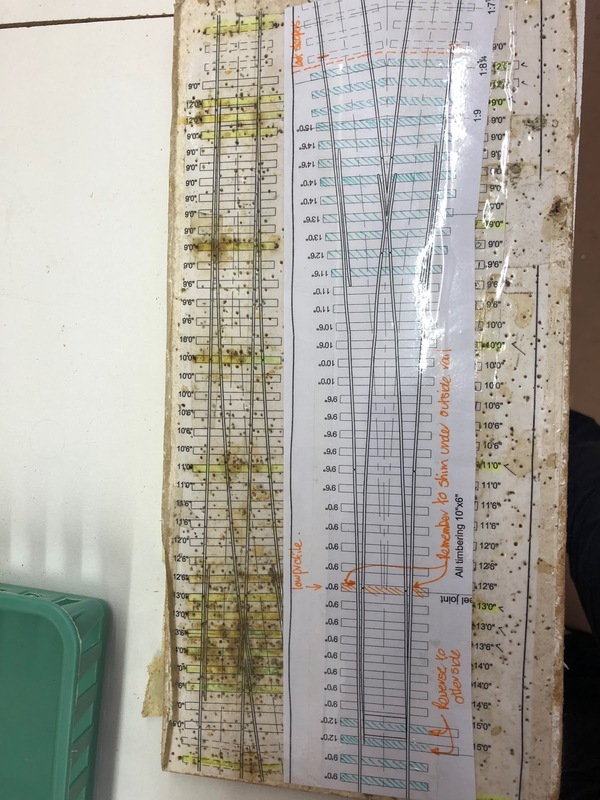 Not a favourite job of mine that's for sure. Here's a progress shot to show how I've glued the sheets on. The shed has been set on the layout and I've begun the landscaping around it. This has been a longer build than I expected, but I'm happy with how it's come together. Those of you who've read previous posts would have seen this area with completely different buildings on it. Well I am much happier with this current arrangement and it was in my original plan. The process of constructing and landscaping a layout, I've found, can be quite a fluid thing. When I was putting together the original ideas for Splitters Swamp Creek, I had fairly lofty ideas of what I could include in the design. As time has gone on I've changed some ideas and tweaked a few others, but overall I've stuck to the original concept. Due to space restrictions I've had to alter some ideas, but I have found a little more room than I originally thought I had. In a previous post I put together some buildings with some new weathering ideas with the idea of creating a scene at the end of the layout. This was a complete departure from the original plan. The picture I had in my head for this area was well and truly out of scale. So it now resides elsewhere on a mates layout. I reverted to the original plan that included some basic loco facilities. 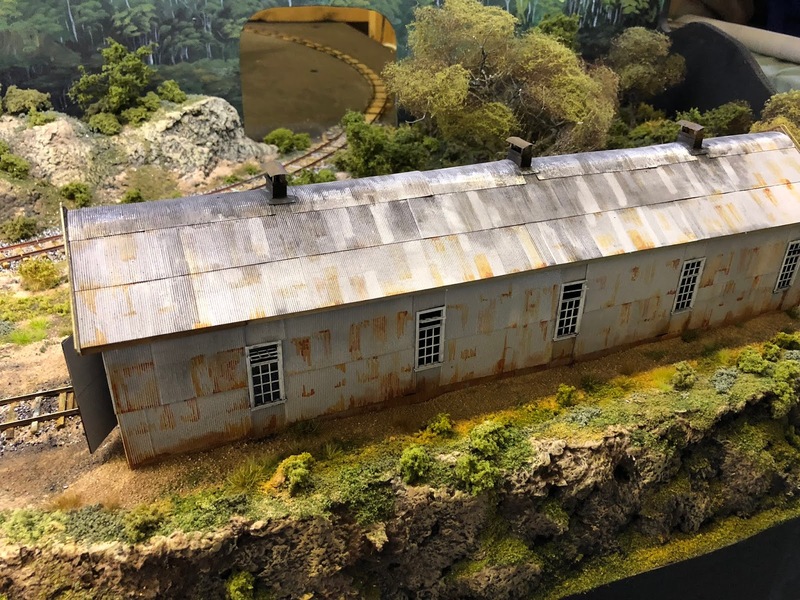 Those being a loco shed, coal stage, and a second goods shed. Once I'd made the decision to revert to the original idea things have started to move forward nicely. 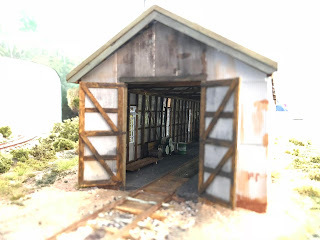 I've began with the locomotive shed. The area that the shed occupies has meant that the baseboard has had to be altered to how I'd finished it for scenery work. Thats ok as like I said I need to keep the process fluid. 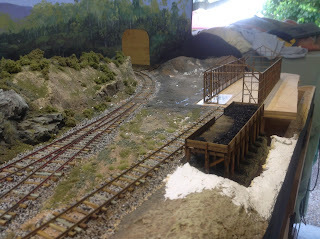 I have worked out the footprint of the loco shed and the coal stage and they work in well. 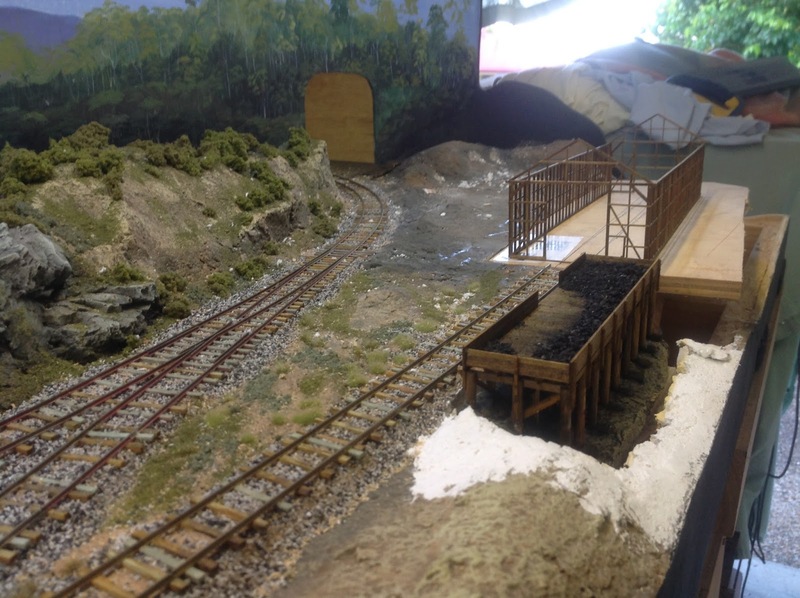 The coal stage has been finished and the scenery will be added to the base before adding it into the environment. The loco shed has been a bit of a process to construct. I like to try and keep the timber to the scale sizes that were used in the original building, and also I like to try to copy my impression of how it would have been constructed in the real. I decided to build individual frames for each 'bay' of the shed, and then use a jig to hold each frame to then allow the studded walls to be added. In theory this would work. In practice it proved very challenging. A couple of photos here to illustrate. This first one shows the frame that I made up sited in the jig. These worked ok, but when added to the jig in the photo below and the wall detail added, they just weren't strong enough. The individual noggins ( I hope that's the right term) had to be cut up in matching parts for bay 1,2,3, and 4. As you can see from the numbers on the plan. It seems I'd forgotten a rule that I'd made up myself. 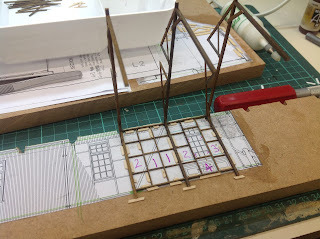 That being that the model construction had to be as close to the original as possible, only as far as the resulting structure has to be strong and rigid enough to be self supporting. The building in the photos above was not. So what now? Well I actually went back to online photos, whether they were from facebook or other sources. The result was an idea to construct the walls differently, and it seemed, closer to how they were, rather than the written plan. I need to be ready to restart something that just isn't working. Instead of flogging a dead horse. Above you can see that I've constructed a whole side of the building over the plan. I did the same for the other three walls. I haven't discussed windows, so here's a photo update. I chose one as close as possible, however they are not perfect, but close enough I think. Those are the ones from tichy train group #8157. With all four sides completed I joined them together and placed them on the layout for a mockup of that area of the layout. The coal stage is in the shot also. 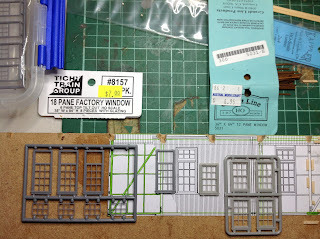 The base board has been trimmed since then to fit the space available on the layout. 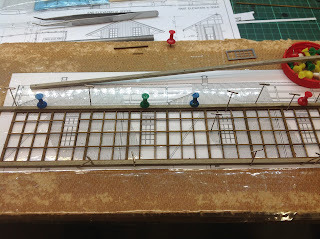 Next has been the construction of the roof. I kept the original frames and removed the 'legs' to just have the truss. The jig is a simple one, but serves its purpose well. Next is the addition of the smoke hood that goes down the centre of the building. This has been a little bit of a steep learning curve also, with a change of process on this as well. Basically it will be board by board as seen here. That's where I'm up to today. It has been a challenging build, and not over yet by a mile, but enjoyable. Some Sites I use for Supplies and Inspiration. AR Kits- Al & Barb, what great products! Even better service! Modratec-for your point/signal operation, this is a great product, with plenty of products to be used on your layout, with a very efficient mail order service. the Titfield Thunderbolt Bookshop-some fantastic modelling books here, worth a look. 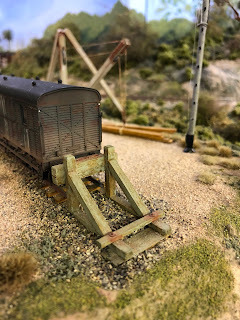 Rusty Rail-have a look at this, I couldn't come close to building these myself! 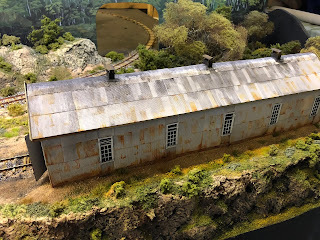 Scenery Express- some great modelling products here! Details West-I use the point detail bits, but there's lots more here! Gilbert Gribi- I don't speak any French, but there are some great models here!